What are your hands doing right now? They’re probably not folded peacefully in your lap. My hands are rarely at rest. Even if I sit down to take a break, my hands reach for something to do. I pick up and reread a piece of mail. I tidy the table beside my recliner. I search some topic on Google. “Keep my hands still” never appears on my to-do list, but maybe it should. Hands accomplish wonderful things. They stroke the heads of our children and place checks into the offering plate. They nurture plants and cuddle pets. They distribute groceries to hungry people at the food pantry. They fold in prayer, and they squeeze our mate’s hand before we go to sleep. They also accomplish necessary things like steering cars, pouring cereal, changing sheets, and paying bills. But some things are more enjoyable when performed with quiet, still hands. Listening to relaxing music. Watching a baby sleep. Reflecting upon the goodness of God. Feasting our eyes on beautiful landscapes. Pondering the infinite majesty of God while looking at a full moon or a sky full of stars. In an email conversation with a friend recently, I commented that when Mary of Bethany sat down with Jesus, her hands were probably folded peacefully in her lap. They were not mending socks or composing a grocery list. Notice that in this story recorded in Luke 10:38-42, Jesus did not follow Martha into the noisy kitchen to chat with her while she prepared a meal. Why do you suppose he conversed with the woman with still, quiet hands rather than the woman with the busy, soapy, sauce-splattered hands? Was it because he loved Mary more than he loved her sister? Or was it because Mary chose to give Jesus her full attention? Mary didn’t ask Jesus to follow her into the garden and visit with her while she picked lettuce. She didn’t talk to Jesus with clothespins in her mouth while she hung out the family’s laundry. She didn’t catch up on her dusting while she talked with Jesus. Mary didn’t multitask on that day at that time. While Mary spoke alone with Jesus, she did nothing else. Nothing. Try to picture her serene face as she converses privately with her Lord. The Bible doesn’t record the conversation Mary and Jesus had, but we can speculate. I doubt Jesus shouted accusations at her as he shouted them at the hard-hearted spiritual leaders of the day. He certainly didn’t scold her for not helping Martha in the kitchen. I doubt He scolded her for anything. People who choose to be still and listen to Jesus receive not a scolding, but an outpouring of love and acceptance. Possibly, they receive blessings those of us with busy hands miss. That was certainly the case with the sisters in Bethany. Is it possible that Jesus waits for you and me to slow down, rest our hands, and listen to Him? As my grandchildren often remind me, I am not a good backer-upper. I proved this last summer when I backed over a decorative pot at the edge of our driveway. “I promise you I will not hit those pots,” I said, heading out the front door. “You’re going to move the pots, aren’t you?” he asked. “You bet I am,” I said. Sometimes it is safer to remove an obstacle than try to avoid it. A friend of mine, a very responsible Christian man, began visiting a gambling casino. At first, he wagered only small sums of money, but the habit grew on him. Eventually he realized he had a big problem. He tried taking less money with him to the casino and tried limiting himself to staying only one hour at each visit. But he easily overcame those restrictions and continued betting as heartily as before. Finally, he went to the casino manager’s office and asked to have himself restricted from entering the casino. Security team members would thereafter remove him from the premises if he came through the door. Figuratively, he moved the pots. Another friend obtained a high interest rate credit card. She planned to use the card only occasionally and to keep the amount she charged on it low. Gradually, however, she bought several items of expensive clothing and jewelry and charged those purchases to the card. When she realized she had run up a large debt, she determined to use willpower to pay off the credit card debt and stop charging purchases on the card. She failed. Finally, she cut up the card, and as soon as her debt was paid, she closed her account. This woman also, in a manner of speaking, moved the pots. Sometimes we have too much confidence in ourselves. If I am careful and diligent, I can avoid those pots, get control of my gambling, or change my expensive buying habits. It is important to know when we can trust ourselves and when we cannot. Life usually teaches us this lesson by allowing us to fail a few times. A married woman wishes she had changed jobs when she realized she was sexually attracted to a coworker. She did change jobs later, after the affair, and after the damage had been done. A teacher wishes he had stopped eating lunch in the staff lounge when he realized it was a hotbed of gossip. He did stop eating there after another teacher, tainted by baseless rumors, lost her job. A former heavy drinker wishes he had avoided restaurants that served alcohol. He did avoid those restaurants after receiving a DUI conviction and having his driver’s license suspended. The decorative pots beside our driveway are inexpensive and easily replaced. But marriages, sobriety, integrity, financial stability and the like deserve protection at any cost. If you suspect you are heading for a collision that could destroy one of those treasures, don’t trust too much in your own ability to avoid it. Move the pots. These look much prettier in the spring with flowers in them. I love giving gifts to Sparkle, Twinkle, Shine, and Glitter, the pet names I have given to my grandchildren. But I do not give them everything they want. Even grandparents need to use wisdom in gift giving. My grandchildren enjoy the gifts I give them, but they want more. And they could have more if I were a different kind of grandmother. As young children, this is the grandmother each one of them thinks he or she would like for me to be. Glitter (girl, age 7 months): Give me a grandmother who doesn’t say “no, no” every time I reach for her eyeglasses, earrings, necklace, and wrist watch. Give me a grandmother who lets me have whatever I want. Shine (boy, age 4): Give me a grandmother who lets me slay dragons, have sword fights with pirates, and walk on hot lava. Give me a grandmother who gives me super powers and makes sure I am always the winner. Twinkle (girl, age 5): Give me a grandmother who lets me peel the paper off every crayon in the box, play as much as I want to in the flour canister, and trail strips of toilet paper through the whole house. Give me a grandmother who lets me make big messes that she cleans up for me. Sparkle (girl, age 9): Give me a grandmother who lets me play games 24/7 on her iPhone. Give me a grandmother who doesn’t put limits on me. We can excuse these unreasonable and selfish wishes from children who are still leaning and growing. But sometimes adults want more from the Supreme Gift Giver. This is the God some people think they want. Give me a God who says yes to all my requests, a God who gives me permission to enjoy activities, habits, and indulgences that His Word has labeled “off limits.” Give me a God who never says no to me. Give me a God who keeps me constantly entertained. Give me a God who makes it possible for me take challenges, enter contests, and play in the big leagues. Give me a God who makes sure I am always the winner. Give me a God who withholds unpleasant consequences from me. Such a God allows me to eat whatever I want to eat without getting fat, drink great quantities of alcohol without getting drunk, spend money recklessly without going into debt, and abuse other people without losing friends. Give me a God who protects me from consequences and cleans up my messes for me. Give me a God who doesn’t make demands on my time, one who allows me to do what I want to do. Give me a God who requires nothing from me. Just as a grandmother loves her grandchildren too much to give them everything they ask for, God loves His children enough to withhold some things from us. He promises to give us what we need and instructs us to be content with that. People who want a powerful being who is indulgent and undemanding, one who protects them from all unpleasant consequences, cleans up their messes, and makes sure they always come out winners need to start looking for Aladdin’s lamp. These people aren’t looking for God. They already have one. Anyone who knows me well will tell you I am a wannabe minimalist. Stuff suffocates me. I daydream about living in one of those newfangled tiny houses. Whatever neurotic disease hoarders have, I have the opposite. Thus, when Dan started getting rid of outdoor items he didn’t want to store for next summer, I jumped at the opportunity. Out went the grandkids’ plastic swimming pool and turtle sandbox, the rusted plant stand off the patio, the cracked lawn chairs, a leaky hummingbird feeder, holey gardening gloves, faded pool noodles, and pots of scraggly marigolds, once yellow and orange but now brown and leafless. What else? I queried. I scoured the yard and patio for more potential victims of this autumnal cleansing. Then I spied it, one tiny splash of color in a landscape growing drabber by the second: my potted pink geranium. Yes, the same geranium which has inspired the writing of more than one blog post over the past few months, the great-great-great grandchild of the geranium for whom my website is named. The geranium I almost tossed out weeks ago when I thought its life was at an end. There it sat in the center of the round table on my patio where it had resided all spring and summer. I approached the plant with the aim of finally doing away with it. Yes, it had been a good and faithful plant, had given me more than my money’s worth, and had spurred the writing of several articles, but all good things must come to an end. Mustn’t they? I approached the plant. What yet do you have to give? I asked it. It moved not a single leaf, offered no defense, no plea for indulgence, no request for more time. “I am yours to do with as you choose,” it seemed to say. Well, this is just great, I thought. One more thing to feel guilty about. Did I really want to be the woman who tossed out a plant that had done nothing but pleasure her for months and still had life in it? I stood with my hands on my hips and took a deep breath. “Why would I save you?” I asked. Had I finally asked the right question? I leaned closer and turned an ear to it. “Because you can,” I thought I heard it say. I watched Dan pull his truck out of the driveway, spilling a torn screen from its overcrowded bed. And what of the geranium? 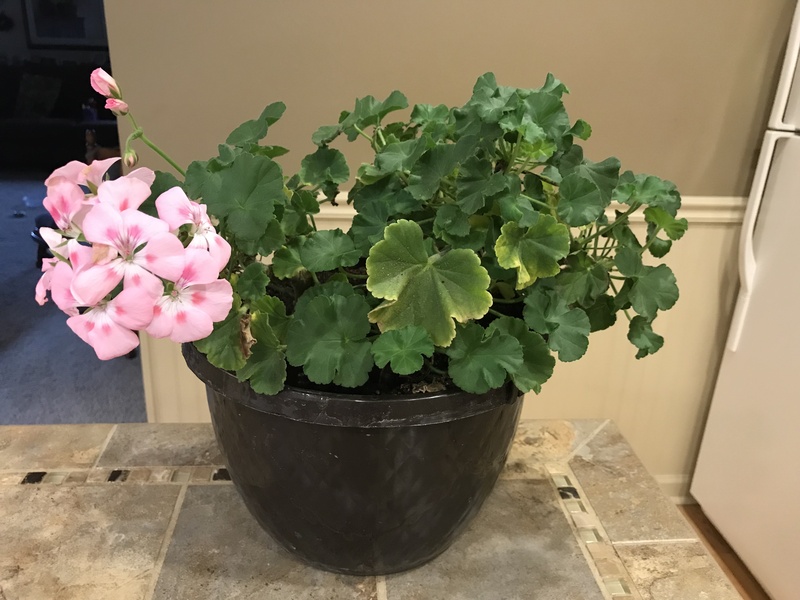 That geranium sits now in the middle of my kitchen island, illustrating once again an ageless truth: Grace is not extended because it has been earned. Grace has little to do with the recipient. Grace is bestowed because someone has it to give. I cut my teeth on the back of a pew in a small country church. My siblings did the same. I can take you to the church and show you the teeth marks. In that church I learned that motives count. Not only should I give, but also I should want to give. I learned that honoring my parents meant more than being good in their presence. I learned the meaning of words I never encountered anywhere else: sanctification, regeneration, propitiation. I knew from day one I was imperfect but God loved me and Jesus wanted to save me. Qualities taught to me at home were reinforced inside that little church. Qualities like integrity, patience, and kindness. God poured His grace down upon me, the little girl who wanted so passionately to be good but knew she would never be perfect. My mind often wandered during church services. Sometimes I silently reviewed the memory verse I would be asked to recite in Bible class. I looked at pictures in my Bible of blind Samson breaking the pillars of the temple and Moses talking to God in the burning bush. I studied my fingernails, picked at my cuticles, and passed an occasional note to my sister. I thought about what I would be doing that afternoon. I listened to my grandma singing alto in the pew behind me and tried to copy her. I fanned myself with a paper fan provided by the Leland Carter Funeral Home. I watched mud daubers whizzing outside the window. I heard baby cousins fussing just a few rows back. I watched my mother tend to my young siblings. I struggled not to laugh the Sunday my brother held chewing gum in his hand and eventually created a sticky, pink spider web between his fingers. I tried to pay attention if the preacher wrote things on the chalkboard. I tried to focus as he pointed to places on one of the big Bible maps that stood on an easel near the podium. Once, in a sermon about the tabernacle the Israelites built on their journey from Egypt to Canaan, the preacher flipped the map pages to one that showed the route they took. And right there, right in the middle of the map’s desert, a mud dauber had built a brown, crusty nest. The preacher chuckled and said, “Well, there’s the tabernacle right there!” and everyone laughed. I thought about going to college. I dreamed about someday driving a car, being a teacher, and having babies. I wondered if I was pretty. I pondered unanswerable questions about whether or not Adam had a belly button and if God could make a box so tiny he couldn’t get into it. I contemplated trying to use faith to move a mountain. I checked often to make sure my slip strap was not showing. I looked down and reaffirmed that I hated my old black, patent leather shoes. Sometimes in church, I listened and learned. But, truth be told, much of the time I daydreamed and wondered and contemplated and planned and pondered and imagined and questioned and resolved. But never once in all those Sundays did I worry that a lunatic with a gun might walk in and blow away my entire family and me. My sister Joni is a book-lover. Yesterday she went to a large book sale, looking in particular for picture books for her grandchildren. After shopping for a while and selecting quite a stack, she took the books to the check-out desk and asked the clerk to hold them for her while she continued to shop. When she finished shopping, she went to the desk to pay for the books she had chosen. The clerk looked at first flustered and then apologetic. I once worked with a young woman who loved nice clothes. One Monday morning she was wearing a new mid-calf sheath that looked especially nice on her. I complimented her on it and then noticed something awry. The price tag was sticking out of the neck opening in the back of the dress. When I was teaching English to adults many years ago, a student came to me at the end of class. She told me she could not submit her term paper, though it was due. As she was driving to class that day, she said, she had car trouble. She stopped at a garage to have a mechanic look at her car. For some reason, she took her term paper into the garage with her and accidentally left it there. Since the paper was still at the garage, she wanted me to excuse her from turning it in on that date. The student called me later in the day and told me she went back to the garage and found her paper, but it had gotten covered with grease. She knew I wouldn’t want to read a term paper that was messy. I told her to bring the paper to me anyway. I would evaluate only its content, not its appearance. I never saw the paper, and the woman eventually stopped attending class. When I was a little girl, the words lie, liar, and lying were not used in our house. An untruth was referred to as a story. The one telling the story was a storyteller, and the act itself was referred to as storytelling. In the three scenarios above, the woman who took the books that were not hers, the woman who “borrowed” a dress from a store, and the woman who failed to turn in her term paper all told stories. I wouldn’t ask either one of these storytellers to housesit for me or to hold my purse while I was in the restroom. 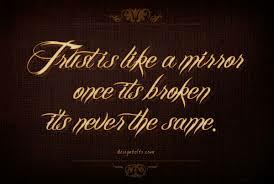 Trust that has been broken is hard to put back together. That is why a mom drags her kid back to the convenience store to return a swiped candy bar. She knows that a stolen candy bar today may be a stolen car years later. Limit your storytelling to the sweet fairytales you tell your children at bedtime. Demand complete honesty from them, and from yourself. Ask any mother. A mother loves her children “to the moon and back,” as she often tells them. She spends years nurturing, protecting, feeding, clothing, educating, consoling, encouraging, disciplining, and every other ing word that can be applied to child-rearing. She would have it no other way. But ask a mom if motherhood has cost her anything and she will tell you it has indeed. She sacrifices time she would like to spend doing any number of other things. She sacrifices money to buy textbooks and bicycles when she wants to spend that money on a new couch or an outfit for a special occasion. Ask any married woman if being married has cost her anything and she will tell you it has indeed. She is no longer living only for herself. Her husband’s needs and wants become as important as her own needs and wants. She doesn’t buy a family car or even redecorate their bedroom without including him in her decisions. A woman who is fortunate enough to be married to a good man pays less in the marriage relationship than the woman who is married to a not-so-good man. But both women sacrifice something of themselves in the marriage relationship. That is what “the two become one” means. Friendships are costly. For example, I occasionally surrender my restaurant preference and eat at a place I don’t particularly like because my friend enjoys eating there. I sacrifice time with my family in order to spend time with my friends. My friends do the same things for me. Of these three costly relationships, friendship offers the most flexibility. Parenthood and marriage are lifetime commitments and deserving of extreme sacrifices, when necessary. But a friendship can grow and thrive or it can lessen or even end. There are people with whom I choose not to be a close friend because their friendships cost too much. Some of these “friends” expect me to become who they are; they want me to think, talk, and act exactly as they do. I am not willing to pay that price. Other “friends” lead me slowly to sacrifice my established life values. They encourage me to spend too much money, to be hypercritical, or to be less than truthful. With friends like that . . . well, you know. Still other “friends” live lives of nonstop drama and ask me to be their great “fixer.” They beg for my help but refuse to accept the help I offer. Mostly, they want a sympathetic ear and my permission for them to remain in their chaotic, unproductive lifestyle. I finally conclude that such people are not looking for friends. They are looking for enablers. I don’t, of course, ignore or demean these people. I am kind to them and help them when I can. But I cannot afford to be a close friend to them. 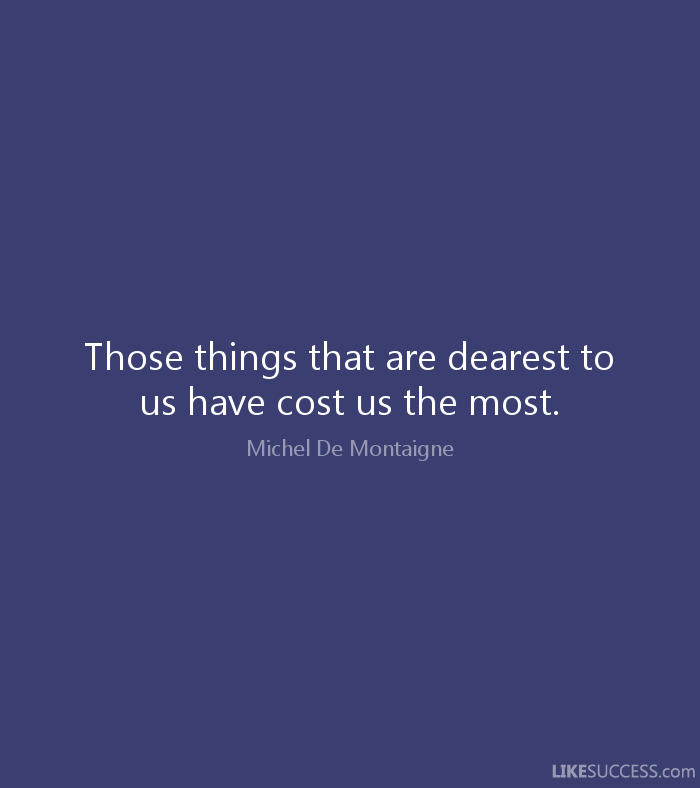 I must not conclude this discussion of costly relationships without mentioning the cost of following Jesus. In Luke 14 Jesus cautions us that the cost of following him is high. He uses sobering phrases like “hating your own father and mother,” and “giving up everything you have.” Those words sound severe, but we must remember that securing a relationship with us cost him everything. Pray that God will give you wisdom as you establish relationships with people. Pray also that he will never allow you to put a relationship with anyone above the one you have with His Son.